Beautiful unity wedding set includes one 3" x 8" pillar candle and two 1" x 8" taper candles. 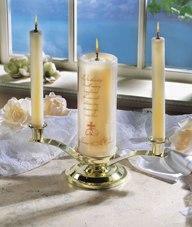 This permanet nylon candle set will become a lasting heirloom to commenorate your union day after day. It is refillable and uses CandlePure Liquid Paraffin Fuel that burns smokeless and odorless. Choice of 2 accetate sleeves with verse or poem are available to decorate your candle during you ceremony. Then simple remove the sleeve and enjoy your candles for everyday use.